I'm planning on replicating this side table. It looks nice, but of course from a stability point of view that is probably one of the worst table designs to come up with ;). A lot of force is on those box joints, of course this is just a couch table for some glasses and a bowl of chips, but still. I'm pretty new to woodworking, and only have an electric jigsaw at the moment, a manual saw and will get some chisels. 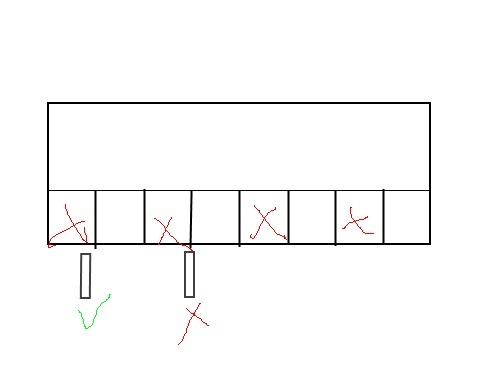 If I work carefully will it be possible to make the joints fit well enough to make the table as stable as it needs to be? Or would I really need precision machines like a table saw with box joint jig? I'm aware this will be quite a bit of work... Any tricks to make this easier? Also, does the wood used matter much? 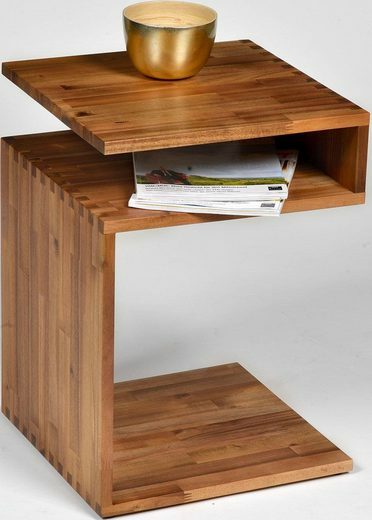 The example table is made from acacia, but I would prefer birch. Is there a difference in hardness, for example? Before I get to the whole box joint part I will tell you there is a difference with hardness is woods. Wood-database is a great website to get information on a given wood. I think acacia is harder then birch. Not to familiar with it. But you could really use any wood you would so like. Also I would get some bar clamps for the gluing part. And for glue I recommend Titebond. I use type 2 (water resistant). Now I going to make some pictures but they are not going to look the best, since I will have made them :). So here is the process I go by. So in the image above is the first step. Going from one end of the board tote other end measure at 1/2 increments (or to your liking). And you need to put the lines back the same distance as the thickness of the wood. So you know were to stop. The best would be to draw a line across the back of them lines so you do not go to far. Going to far will cause a gap OR the finger will hang out (if done for all of them. But not like in the image, do each one separate. but make sure that you do it from the same side on each or it will not line up, if that makes sence. Then once done and them lines line up put a X on every other. Those you will be cutting out. So above I have the 'wood' up close with the X's. The little squares represent the jigsaw (or any other ) blade. You should have the blade a little ways from the line. If it is centered on the line you WILL have gaps. And as you may guess by having it a it away there still will be some wood to remove. That is were sandpaper or a chisel can come to play. I recommend sandpaper. Take a block that is smaller (width) so you can get in there and file away the wood to the line. This will give you the most control*. I would use 60 grit sandpaper. a chisel would work, but I think that the chisel can go off and chip out what you do not need. But can still be used to get close and finish the box. Just take your time and it will pay off. Gluing is easy (I think). Just glue like you would any other board. It does make a difference were the clamp is. Have the one clamping end on the tooth, were the one board touches the other. Hopefully you get what I mean. There are many different jigs for a table saw and router table. But I have always done it with a band saw since I do not have the greatest luck with a router table or a table saw. There are many jigs online and on YouTube. You could also do a dovetail but I think for you being a beginner learn to do a box joint before a dovetail. If you have any other question or I did not cover something or have any other questions let me know in the comments below! *You have to keep square to the wood. And when sanding watch how you do it. I see people sand and go in a U or C like 'stroke'. I think you get what i mean just keep square. While the design shown should be adequate for light loads, it may be helpful to others to understand the way the table works in transferring the loads to the base for future projects. The performance of the table joints under load will not depend upon the species of wood so much as the design and execution of the finger joints. Whether the joints hold up to any loads will depend upon the number and size of the joints, the number and contact surface area, the quality of the joint contact faces, and the extension length of the table surfaces away from the connection points. The further the weight is from the joint the more leverage is applied with increased strain transferred through the joints. Any weights applied to the table top must be transferred to the floor through the joints. Therefore the shorter the distance from the joint possible for a weight to be placed, the less force applied to the joint. The dimensions you choose for a project are made for function, but the design must consider the size of the top and the possible distance from the joints. The joints themselves primarily need to resist rotational forces which are transferred through the side faces of the fingers via the glue connection. There are two possible means for failure at these connections. The glue can fail in its bond to the wood or the wood face fibers can tear out from the stock. To maximize performance the joints should be uniform and snug to insure the glue does its job well. Too much glue used to fill voids in the wood contact will fail before a fine even coat of glue. The wood at the fingers will be under shear stress due to the rotation force in the joint. This means that the fibers of wood will want to tear loose from adjacent fibers deeper from the surface. Woodbin.com provides information on wood shear strength (also check out the "wood" tag wiki for other resources). Clearly denser hardwoods have more shear strength than softwoods such as pine and will have increased capability to resist rotational shear stress. Thicker boards are better. Each finger joint will provide a small portion of the overall strength of the joint. Clearly the area of contact in each joint will matter. The thicker each board is the more strength it will have. Doubling the thickness will quadruple the strength of the joint due to increased contact area. More fingers are better, up to a point. How many you need, structurally, depends upon the weights it must support. Determining the exact number necessary is a structural engineering calculation beyond the scope of the answer. That number will certainly be less than what is pictured for this design. After that count the rest is mostly aesthetics. Obviously the more joints you include the thinner the thickness of the individual fingers. How thin is too thin is a good question. I can't offer a supportable answer for that at this time. My instincts tell me 1/4" is a minimum finger width, but I would not be surprised to hear the fingers could be much thinner and still perform as well or maybe better than my declared minimum. These (and much more complex) joints have been done by hand tools alone for centuries, and there is still a strong following of hand tools only woodworking. The box joint you show here is pretty simple, with all angles at 90 degrees. To use the tools you mentioned, the best tip would be to cut everything too small with the jigsaw (or even the hand saw), and then do the final trimming to the exact size with chisels (since it is easier to remove more wood that to add wood where you've cut too much). 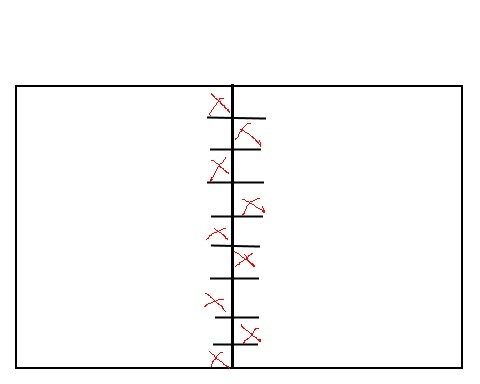 Also, first do one side of the box joint, and then use it to mark the opposite side (instead of marking both side at the same time and cutting them together). This will help ensure that the two parts fit well together. A specific advice about chisels is to keep them sharp. You might think they come sharp out of the box, but typical chisels are far from their full sharpness when bought. Chisels will also dull during work, so sharpening them is an important skill to learn and master. There's a ton of sharpening information online and on this site. The box joint is sort of the machine equivalent of the dovetail joint; by having all the cuts at 90 degrees you can more easily mechanize the joinery and thanks to the resulting increase in speed you can make many fine 'fingers' to give you massive glue area. This is good since the joint relies entirely on glue to hold it together. Dovetailing has the advantage of mechanical interlock in addition to glue. Because cutting the tails and pins by hand is slow you generally will have fewer of them, more widely spaced than with a machine made box joint and therefore you have less glue area. All this is to say that, since you are cutting the joints by hand, you should consider using dovetails instead of box joints. It will change the look of the piece though. Whether you go with dovetails or box joints you should look up the procedure for cutting dovetails by hand - you will find it in many books and in many places on the internet with small variations. If you are using box joints you will only have to modify the instructions slightly so that all your cuts are at 90 degrees. Usually the goal when hand cutting these joints is to saw accurately enough that no clean up with a chisel is needed. It's much, much quicker that way and if you can manage it gets a great result. I haven't tried it but I imagine with a jig saw it will be hard or impossible to make the cuts accurately and cleanly enough that no clean up with a chisel is needed. I would recommend sawing as close to the line as you can manage though. Alternatively you could buy a dovetail saw and practice with it. Actually I would recommend you do some practice joints whichever method you settle on. A jigsaw is not the right choice for this. Much preferable to cut this using a hand saw of some kind. but of course from a stability point of view that is probably one of the worst table designs to come up with ;). Actually the design is very stable, in all ways you might mean it. The cantilevering makes it very stable in a gross physical sense. The grain of all parts is in the same orientation so it's stable in terms of seasonal movement. And the box/finger joints have tons of glue surface area so they are inherently very strong if done well. Overall the table is probably a lot stronger than you'd think. Based on a discussion I read about a chair project (yes a chair!) built similarly this should be much stronger than many woodworkers would assume from looking at it. I'm pretty new to woodworking... If I work carefully will it be possible to make the joints fit well enough to make the table as stable as it needs to be? But if I can put it this way, there's no reason a relative newbie can't build something like this if they were diligent and didn't rush. Or would I really need precision machines like a table saw with box joint jig? A jig and a table saw or router would of course make this a lot simpler, faster and less effort, but needed? No, no more than power tools are needed to produce M&T joints or dovetails. Any tricks to make this easier? Practice is actually the thing that'll make this easier for you. It sounds trite but even hand-cutting dovetails is basically a very simple process at heart yet many struggle to do them well initially for a host of reasons. But once they have tackled enough of them to become reasonably proficient they can find they're actually relatively easy to do, and a real pro can do them amazingly quickly despite the precision that's required for them to fit well. There are lots of guides online to doing dovetails by hand and you can essentially adopt the process wholesale when doing these, i.e. cut 'pins' or 'tails' first (obviously no actual pins or tails here), then transfer marks to the interlocking piece, so that any irregularities are allowed for. Some of the following Q&A may be of help: How do experts make dovetails by hand that fit so well? Box joints are machine joints. Period. They are great for multiples of boxes, or if, as in this example, the design is asking for something more industrial. If I am only doing one, its just as fast to cut dovetails, because of machine setup time. I size fingers based on the job, and I would certainly heed Ashlar. But I really like the old Sears Roebuck boxes with 1/8 fingers - which works great with a one sawblade. Cutting a jillion of those things is tedious, so I might simply stack two blades, or pull out the dado. Tons of youtubes on how to make a box joint jig for the table saw. Lots of guys use a router table to good effect; I have not. Not the answer you're looking for? Browse other questions tagged table-making box-joint jigsaw or ask your own question. How do experts make dovetails by hand that fit so well?